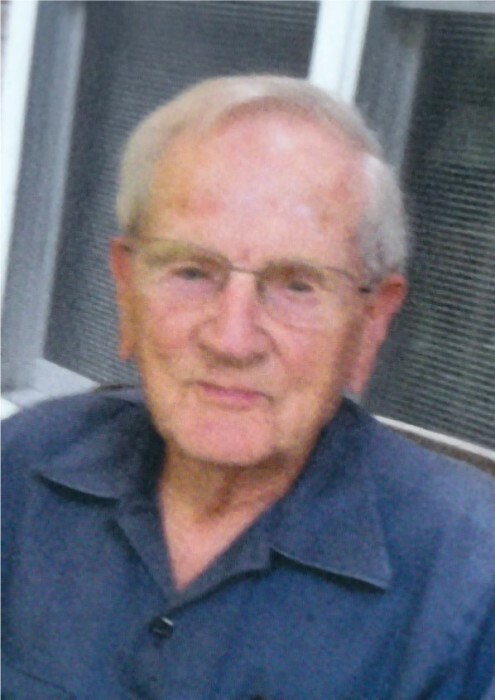 John Gustav Wilkening, 99, a resident of Quincy for over 70 years, passed away on Thursday (March 21, 2019) at the Illinois Veterans Home in Quincy. Born April 26, 1919 in Regina, Saskatchewan, John was the son of John Joseph and Olive May Acklam Wilkening. John grew up in Saskatchewan and worked in Idaho and California before enlisting in the U. S. Army. He served in the 82nd Ordnance (HM) in North Africa and Italy during WW II. He was awarded the European-African-Middle Eastern Theater Ribbon with 3 Bronze Battle Stars. Following his discharge, John returned to Quincy and married his beloved, Vera Catherine Schafer on May 1, 1945. John and Vera raised five children while he was employed at the Chevrolet dealership. He later owned and operated Wilkening Hydraulic Service for over 30 years until his retirement. John was a wonderful father and was forever helping and supporting his children in all of their various activities. An avid outdoorsman, he loved gardening, hunting, fishing shooting and being on the river. A longtime member of Ducks Unlimited, John enjoyed making duck calls, collecting guns, duck decoys and other duck collectables. Survivors include five children, Terry Wilkening (Nancy) of Pea Ridge, AR; Karen Wilkening of Granite City, IL, Michael Wilkening (Celinda) of Conifer, CO, Pamela Hoekstra (Elvin) of Glen Carbon, IL and Debra Hampton (Jim) of Fallbrook, CA; six grandchildren, Greg Wilkening, Brad Wilkening (Kelly), Brett Wilkening (Leah), Lisa Johnson (Scott), Kelley Faber (Andy), and Zachery Hampton (Jenna); two step grandsons, Ted Scott and Tony Scott (Jewel); six great grandchildren; four step great grandchildren; a sister in law, Venita Baker (Richard) of Liberty, IL; and many loving nieces and nephews. John was preceded in death by his parents; his wife of 53 years, Vera; and two sisters, Ruth Frisk and Olive Frost. A special thanks from the family to John's buddies, Donnie and Opie, and the staff of the Illinois Veterans Home for their love and care. Private graveside memorial services will be held at a later date in Bluff Hall Cemetery. Memorials may be made to Ducks Unlimited or the Illinois Veterans Home Activity Fund.